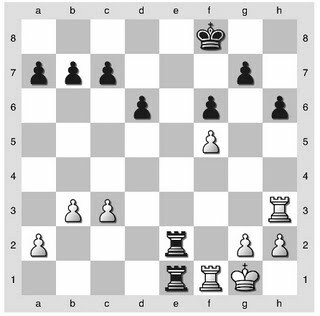 Here it's White to play, and as noted below White faces a grim defense, being one pawn down and having isolated doubled pawns. I would go so far as to say that if the rooks are taken off the board, White is lost. White must keep and activate at least one rook, trying to create (in combination with the bishop) weaknesses in Black's queenside pawns. In White's favor is Black's kingside pawn structure, which is wretched - if the black king drifts from the kingside then a White rook can bring serious pressure from the g-file. 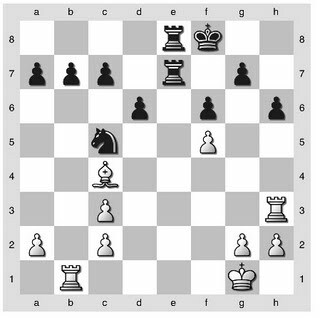 Or White can try to exchange kingside pawns and perhaps open up space for a rook to penetrate. 24. Rh3 Rae8 White has wasted 3 of the last 4 moves with 'mysterious' rook maneuvers, though to be honest I think this position is almost lost at any rate. I think White may have been planning to break up the Black pawns with a g-pawn sacrifice, but this plan is too slow if also dubious. 27. Bb3 NxB? A mistake of overcaution - I didn't like the way the Bishop controlled the vulnerable light squares of Black's K-side, but those square are empty and unneeded. Better is 27....a5 starting the Q-side pawns rolling and gaining tempo on the immobile bishop. 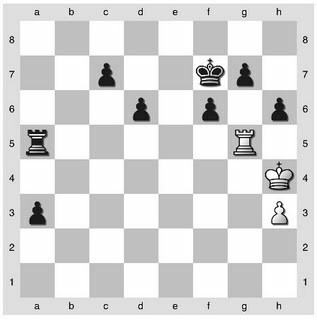 I thought the Rook endgame was simply won for Black, and while it is won it is not entirely simple. 30. Rf1 R8c2?! The priniciple of two weaknesses is handy to remember - a single weakness is defensible in the right circumstance, but two weaknesses are almost impossible to defend against a vigorous attack. 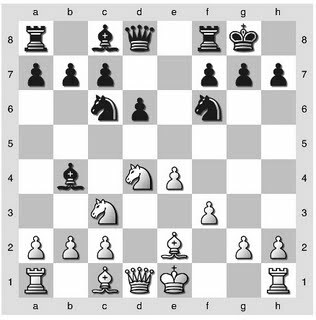 White's weaknesses are 1) A 1-pawn deficit, 2) Backwards Q-side pawns. My last move was meant to provoke a rook exchange but White does not need to oblige and can take steps toward resolving their second weakness with 31. a4! Better for black was 30...b5! 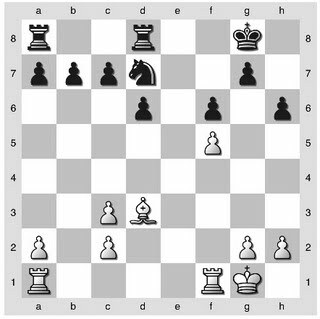 fixing White's weakness and developing a passed pawn. 31. RxR? RxR+ Missing 31. a4, and now the endgame is again lost. Always look for the second resource! 34. Kf1 a6?? Black now needs to capitalize on the progress that has been made. I wanted to play ....a6, ...b5 and ...bxa4, but at any time White can prevent this plan, most easily with 35. c4 and it is not clear how Black can improve his position. With Black's king stuck on the K-side because of the weak g-pawn, White has real chances to draw. The correct plan, which I saw but misevaluated, is to play 34....d5 35. Rd3 c6 36. c4 dxc4 where I feared the penetration of White's rook onto the 7th and a pawn massacre. A closer look reveals of course that this position is winning for Black but I did not look deeply enough and chose a 'safer' continuation, one which should safely draw as it turns out. 36. Re4? Rc2! White's last chance was the simple axb when the 3 vs 2 pawn structure on the Q-side may yet be good enough for a draw with best play. Now the loss can be forced. 39. h3 Rd2! 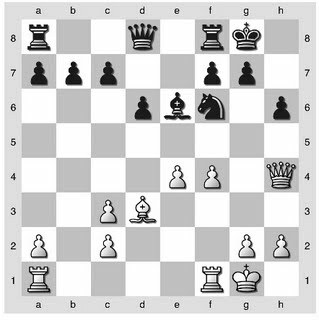 The rook will go to c5 where White can no longer defend all their pawns, and with a two pawn deficit the game cannot be saved. On the next move Rc4 will win either the a-pawn or c-pawn, all can't be defended. The game continued to the 56th move as my opponent played for a trap - What should Black really not do in this position? Fortunately I wasn't inebriated at this point. Most chess players probably have that one opponent who, although they are otherwise no more skilled than you, seem to dominate you in face to face match-ups. One or two drubbings can be written off as bad form or bad luck, but anything more starts to look like a pattern. Last week I was playing just that opponent in the Westfield Club Championship. Up until this year, we had played 4 times and I was down +0 -2 =2, with one of the two draws being a lucky save on my part. Then a few months ago we met again, and I was prepared, psychologically ready to trash my nemesis. After a cute tactical trick I was piece up in a rook endgame, when I decided under time pressure to sac back the piece to take the rooks off the board and transpose to a won king and pawn endgame (so I thought). It was only in the midst of this horrid combination I realized my opponent could promote a pawn if all the pieces were off, so I had to break off midway and try to defend a rook vs bishop endgame, which I ultimately failed to do. I would post the position except I think I would have to gouge my eyes out like Oedipus if I saw it again. Here White could have resigned, but given our record why do that? Thankfully, my opponent played on, because otherwise we would have been robbed of an interesting game (foreshadowing: I do not cooly convert my extra piece). With few pieces left on the board, Black needs only one or two more consolidating moves to put paid to any White threats. I decided to maneuver my knight back to c5 with gain of tempo on the White queen, but I forgot to check all move orders thinking White simply had to avoid the queen exchange. Leading to the following endgame which will be discussed in Part 2. Looks easy, right? 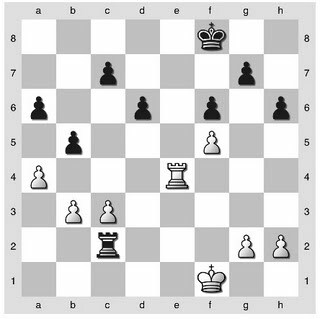 A pawn up (almost two with White's doubled isolated pawns), a knight that looks more mobile than its bishop counterpart. All true, but all the same it transpires that the White's position is almost defensible, and we will see that a draw can be achieved in some circumstances. World Chess Hall of Fame Closed? A building filled with only construction workers and empty rooms. No Fischer-Spassky world championship table. No ancient chess pieces to see. No US Chess history to learn. Apparently, it closed last month. They had a sign on the front door about moving locations and to call the museum's number or visit the before mentioned website for info. BUT (!!) that is the very website that led me there! The number they mentioned is OUT OF SERVICE! God forbid their President, Shane Samole, does his job and makes sure the museum's website is updated so people don't waste their time traveling there. In the Garden State Chess League, the internecine battle between the Kenilworth Karpovs and the Kenilworth Korchnois ended in favor of the Karpovs. My strategic resignation on board 2 sealed our commanding 2.5-1.5 win. Winning my game would have been too mundane. No, it was more important to taunt our opponents with how close the score was. Aided by our parapsychologist Dr. Zukhar we penetrated the defenses of the mirrored sunglasses of our aged opponents. On Board 1 Steve "Petrosian" Stoyko ground Yaacov "Larsen" Norowitz into a draw, Board 2 saw Mike "Smyslov" Goeller get the consolation point, on Boards 3 and 4 John "Kramnik" Moldovan and Max "Carlsen" Sherer wrap up the match, with first blood being scored against Bill "Fish" Sokolosky. Does anyone have a decent book on the Pirc/Modern defense that I could borrow for a week? If you have one and wouldn't mind bringing it to the KCC I'll bring it back the next time.